Emma Woodhouse is committed to a few things - taking care of her father, spending time with her friends, and playing match-maker. Emma herself has decided that she will never marry, but she knows she is the perfect person to find a husband for her protegee Harriet Smith. Her friend Knightley tries to dissuade her, but Emma is determined to help. When everything goes wrong, is it possible for relationships to be repaired? As per usual with Jane Austen, Emma is a satirical look at the construction and limits of class. But this book is a bit more on the nose than some of her others, so the satire can be difficult to see it if you don't know what you are looking for. Emma is forever concerned with appearances and what is appropriate for each person to do. While this story is obviously about Emma herself, it is also about an entire community. We are introduced to many other memorable characters, including the constantly worried Mr. Woodhouse, the talkative Ms. Bates, and the vain and self-centered Mrs. Elton. Because we see the story through Emma's eyes, the reader can either choose to take what she says at face value or look a little deeper. She is always positive that she knows best, even as it becomes apparent that what she believes is not always accurate. Her stubborn insistence gives her room to grow and change as a character, though. Emma has great realizations throughout this book about her knowledge of herself and the people in her life. She is one of those characters that cause people to take sides - either you adore Emma and think she is one of the greatest characters ever written or you wish that she would wise up already! In this book, Jane Austen has a very clear message to get across to readers. Her characters are varied, by class and personality. How do we react when presented with people who look and act differently than we do? Some characters react with haughty cruelty because they believe themselves to be better. Emma is the story of one woman learning to truly see the people around her and treat them with love and compassion. I really enjoyed Emma. 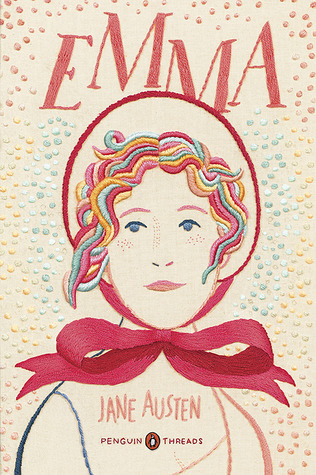 Not a fan of Jane Austen, really, but I found Emma really fresh and funny, and I liked that she was truly flawed, even if at first she is introduced as Little Miss Perfect. I think even if you don't like Emma as a character, there is so much to glean from this story about the way we perceive ourselves and others in the light of reality! I think Emma is funny...the book and the character. What I love about her is that despite all her flaws she has a really good heart. Look at the way she takes care of her father. This book always makes me laugh, but then I'm an Austen fan and pretty much love all of her books. What about you? Did you like this book a lot, a little, or not at all? She does have a good heart and I think the reason she frustrates people so much is that we see her kindness and intelligence but she misses things right in front of her face! Maybe it seems a little too much like our own lives. It frustrated me while I was reading it, but I think I am understanding the value of the story more now that I'm done with it. Emma is definitely one of Austen's most memorable characters. As a side note, I really like your copy's cover. It seems to fit the book really well! I liked it too! I have a habit of deciding to read a classic and then picking out the prettiest edition that my library has. That one is a Penguin Threads Edition, so it looks like it has been sewn. You can even see the backs of the threads on the inside of the cover. They have Little Women and The Secret Garden too. I haven't read this one, but it seems this one is a light-hearted story and fun to read, so thanks for a good review! Emma seem to be the favorite Austen of many readers! I feel like I've read Emma, but perhaps I haven't... Who knows?! Certainly not me. Perhaps a 'potential' reread would be good. I love it when a classic conveyed a message when written, as well as still today - as you say, truly seeing those around you etc. It's tough to remember all of the books, isn't it?? I know a lot of readers who enjoy Austen re-reads, especially in the fall or winter. Emma is one of Austen's books I haven't read, but after reading this something tells me it's one that I might enjoy the most. I love that her writing tended to stay in the same realm, but she was able to hit different notes in each story. She does have some similarities but not enough where the reading gets stale. Which one is your favorite? Emma is one of my favorite Austen characters, because she has a lot of flaws but really means well. She lives within a class-based system and can't necessarily understand the needs of the less fortunate. I also love that she's the rare female literary character who isn't interested in falling in love or being married, but does perfectly well on her own. I'm glad you enjoyed it.